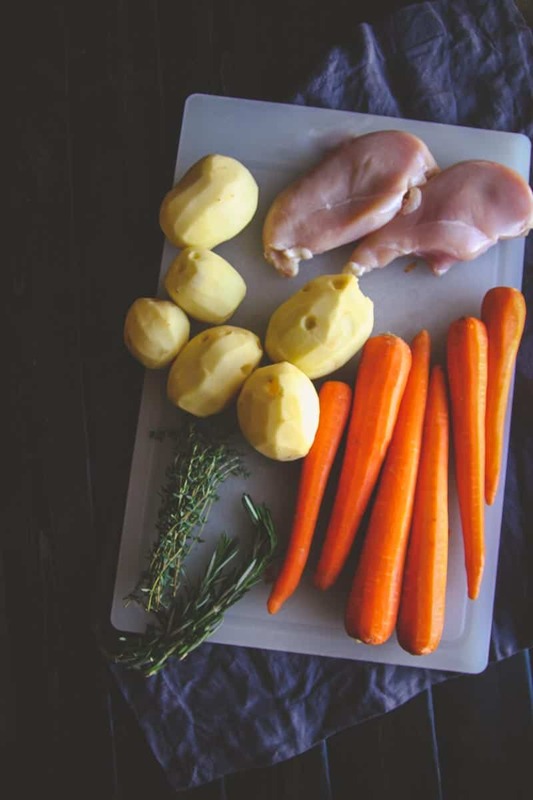 This recipe for baked chicken, potatoes, carrots and herbs also happens to be one of the most popular recipes on my website. Since making it, and posting it way back in 2013 (wow, how time flies) I’ve made this dish countless times, and have gotten so many amazing emails from readers who’ve made this, it was high time for a few newer pictures. We live really close to an amazing Farmers Market, I’m talking walking distance! So what I love to do in the summer is take my wonderful husband as a bag carrier and head to the Farmers Market. Why do I need him with me? Well, because as I explained to him, if I go by myself I end up buying way to much stuff -like watermelons for example- and then drop them on the way home (this actually happened … and more than once lol) so I clearly need supervision and help carrying the bags! Do you go to the farmers market? 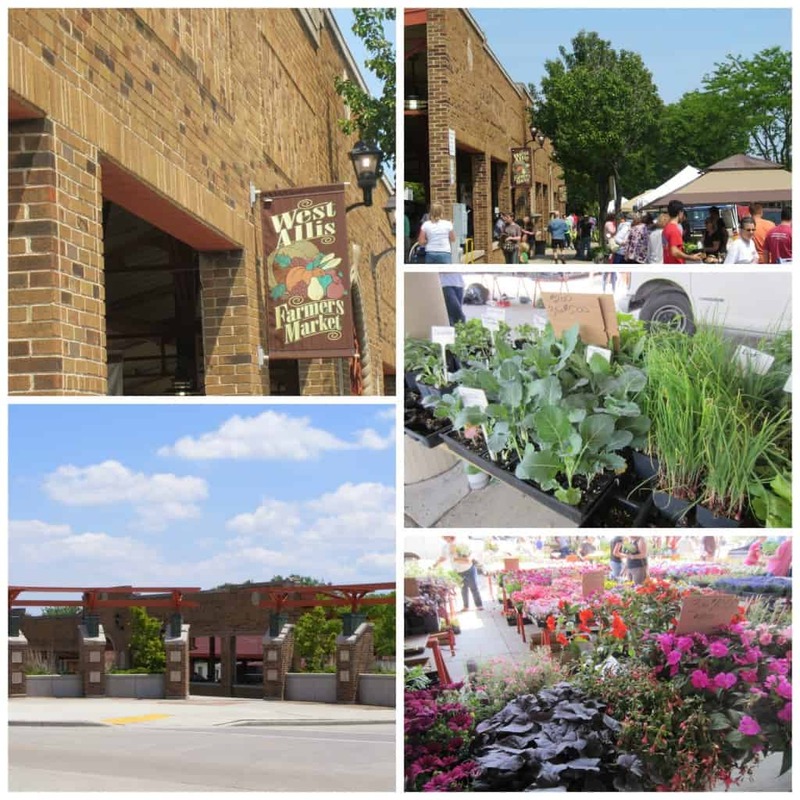 The Farmers Market we go to is the West Allis Farmers Market, and I frequently post pictures of in on my instagram (like here) because I love it so much. 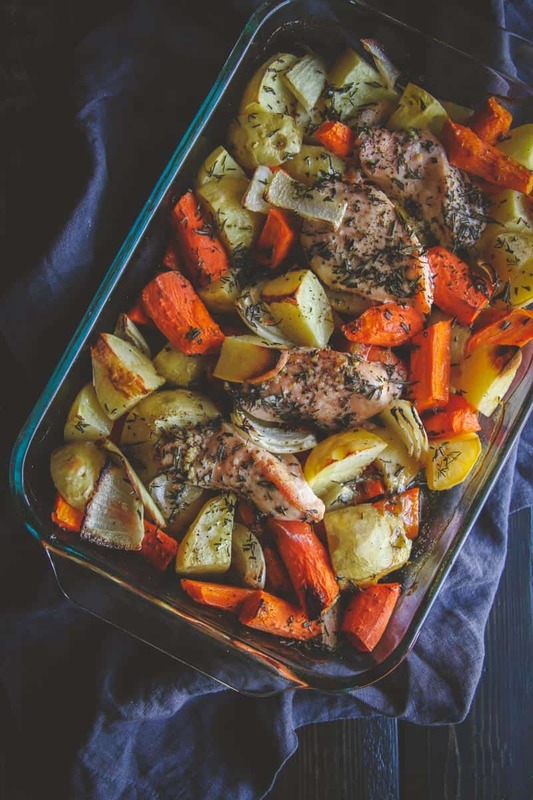 If you’re looking for other roasted vegetable and chicken dinner recipes, here are a few of my favorites: roasted vegetables with chicken sausage, roasted whole chicken and carrots with lemon and thyme<–a huge favorite dish of mine, and roasted potato and kohlrabi salad<–makes a great side dish as part of this farm to table dinner with rotisserie chicken and ginger glazed carrots! I use a Pyrex baking dish like this because after I’m done baking it and want to store leftovers in the fridge, I just put the lid on it. These baking dishes with lids are truly my favorite ones and I use them ALL the time. 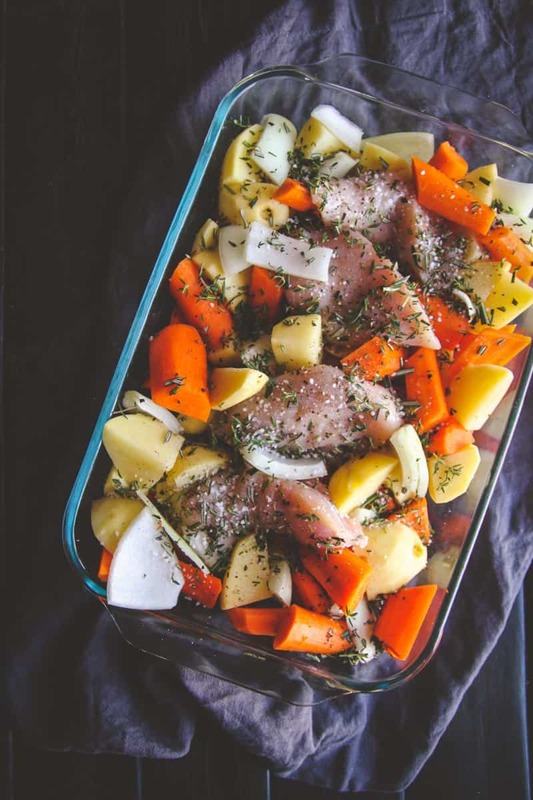 This baked chicken, potatoes, carrots and fresh herb recipe is totally customizable to what you have on hand. Instead of fresh herbs you could use Italian seasoning (I would use 1 and a 1/2 teaspoons instead of 2 tablespoons fresh herbs). Peel and cut the vegetables and herbs. 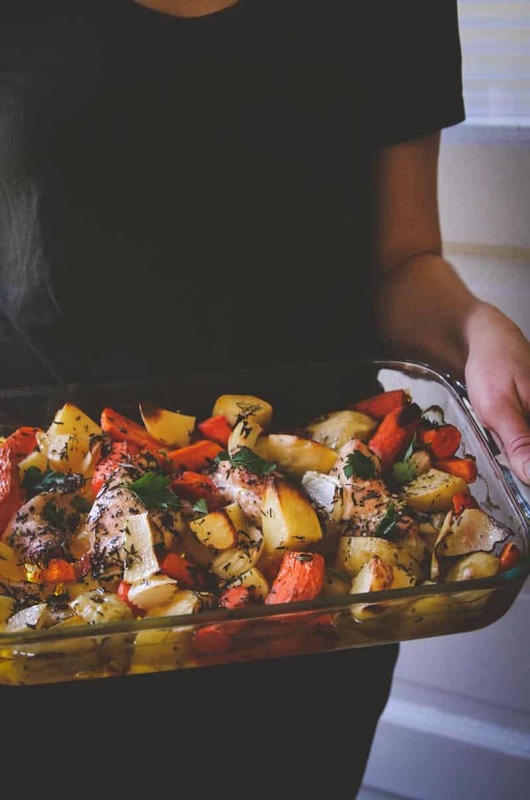 In a large baking dish scatter the onions, potatoes and carrots, sprinkle with half the salt, pepper and half of the fresh herbs and half the olive oil. Next add the chicken breast on top of the vegetables and slightly nestle them in to the vegetables. Drizzle remaining olive oil over the chicken, then sprinkle remaining fresh herbs and salt/pepper and garlic and onion salt. Bake for 55 minutes then check for doneness, the potatoes should be soft when poked with a fork, remove from oven, allow to cool for 5 minutes, then enjoy! This recipe is made with large chicken breasts. 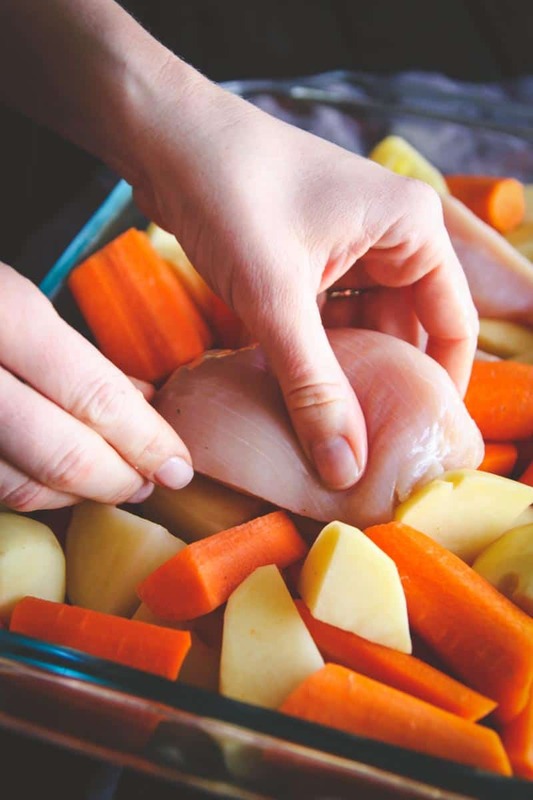 If the chicken you're using is on the smaller or thinner side, I would recommend adding it halfway through cooking as to not dry out the chicken. 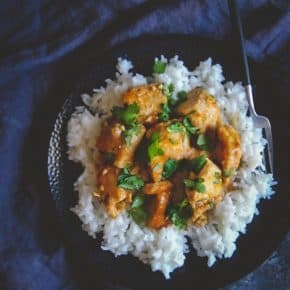 You could also add in a can of crushed tomatoes or cream of chicken soup if you like a saucier dish, I happen to love the roasted quality of this dish without any sauce. 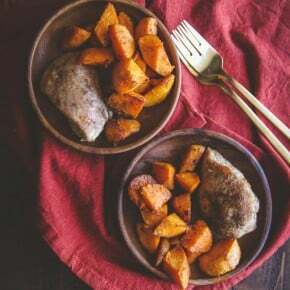 If you make this recipe and love it as much as my family does, I’d love to hear your feedback in the comments section. I tried this for the first time. I used italian seasoning, chipotle garlic seasoning. Then I made onion and mushroom gravy to put over the potatoes. It was delicious. Ill definitely make this again. It was so quick and easy too. I love it and the boyfriend loved it!!! Your variations sound amazing, so glad you liked this dish!! Very easy to make. Almost same way I have always made chicken and vegetables and potatoes. 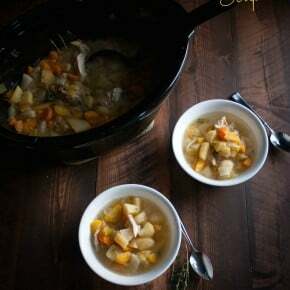 Thank you so much for commenting Lynn, so glad to hear you enjoy this recipe! This dish was delicious. My boyfriend and I added red delicious apples to it. Thanks for the recipe. I usually keep it uncovered because I like with the vegetables/chicken brown. But you could definitely cover it if you’re more comfortable with that! Awww, thank you so much Nancy, that’s so nice to hear! I’m so glad you liked it! Making it tonight! I’ll let you know! All I know right now is my house smells like heaven!!! I made this for the first time yesterday and it was so good my husband and children loved it.Cant wait to try some of your other recipes. I made this tonight and it was soooo good. I decreased the amount of potatoes and added Brussels sprouts. Thank you for the recipe! I made this with a few variations. I added a chopped green pepper,small chopped jalapeño, to the veggies. I then mixed 1/2 the envelope of Mccormick fajita seasoning packet, 1 tbsp of chopped garlic & a bit of oil with the veggies. In a bowl I added the remaining seasoning & 2 tbsp bacon grease (melted) and coated the chicken. Assembled & cooked as directed. Yummy, a south western version of roast chicken with veggies. Hi, this looks delicious I can’t wait to try it. I’d like to use chicken drumsticks, would I have to alter temperature or cooking time? Thank you! I hardly ever cook, but this looks delicious!! Im trying this tomorrow! Hopefully this will help me to start cooking dinner!! Oh I’m so happy to hear that, so glad you love it! I made your receipe last night in my new Brevilla Oven. It was simply delicious. I also included some celery, green beans, and mushrooms. It was a big hit. I will make this again very soon. This is close to traditional Southern Greek (region of Sparta) Sunday dinner… Same ingredients with the addition of tomato sauce, garlic, oregano, and black pepper.. You will see village people leaving their raw prepared dish with the village baker on their way to church, then they stop and pick it up cooked and ready to eat on their way home. With crusty white village bread, and a good wine it is amazing! Thank you so much for sharing the story of how it is close to a traditional Southern Greek Sunday dinner. I love how it can be left and then picked up baked and served with bread – sounds like such a great addition! !